This page describes the history of an earlier Sturmey-Archer fixed-gear hub. One of the rarest and most interesting bicycle components ever made is the Sturmey-Archer ASC hub. At the time it was made, in the early 1950s, sporting cyclists in Britain were very heavily into time trialing (partly because that was the only form of racing that was legal on the public roads!) The most common event was the 25 mile time trial, and many, if not most, of the top riders rode fixed-gear bicycles. Derailer gearing was not looked on with favor by most British cyclists until the 1960's, so most multi-speed bicycles in Britain were equipped with Sturmey-Archer 3- or 4-speed internal-geared hubs. The ASC was a true fixed-gear, in that coasting was impossible...the pedals would turn whenever the bicycle was in motion. However, it gave three different ratios: direct drive; 90% and 75%. In addition to being targeted at time trialists, the ASC was also marketed as the ideal gear for winter training...and there's much to be said for this claim. A fixed gear is well known to give superior control on slippery surfaces, but a single speed can be a bit of a burden on a cyclist laden with heavy winter clothing. The ASC is the rarest and most sought-after Sturmey-Archer hub. I have no idea where you can find one, so please don't bother asking. The last one I know of changing hands was sold on eBay for over $300 in May 1999. If you're very handy, you may be able to make a two-speed fixed gear hub out of a common AW three speed. 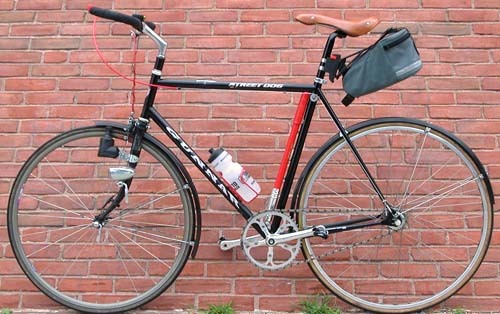 See my Web page on converting an AW to fixed gear.